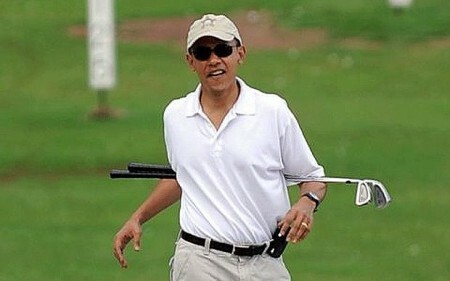 While President Obama continues to golf, a new poll shows voters would blame Obama and the GOP equally if fiscal talks fail. Since returning from a trip to southeast Asia on Nov. 21, President Obama has found time to play three rounds of golf but has only met face-to-face once with Speaker John A. Boehner. A new poll finds that a majority of voters would blame both President Obama and congressional Republicans equally if efforts to find a deficit deal to avoid the “fiscal cliff” fail. Fifty-six percent surveyed in a new Wall Street Journal/NBC News poll say both sides would be responsible if a compromise is not reached. Nineteen percent would blame Obama and Democrats only, with 24 percent saying the GOP would be at fault. Those numbers could suggest a shift in public opinion as both parties work to find a way to prevent tax rate hikes and automatic spending cuts from taking effect in January. Prior surveys have shown voters more likely to blame congressional Republicans if talks fail.